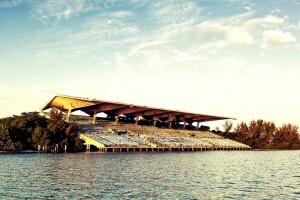 The WFPF began its longstanding relationship with the Friends of the Miami Marine Stadium when we got involved in the effort to try to save this beautiful iconic structure. Through part good fortune and part the kindness of WFPF affiliate athlete Spencer Mulligan, we were introduced to the stadium and the Friends of the Miami Marine Stadium, which led to shooting a WFPF Parkour promo video to show the beauty of the stadium in an effort to help save it! Today we received news that the City Commission of Miami has approved the site plan for Miami Marine Stadium and this moden masterpiece is officially on the road to restoration! We are looking forward to seeing what the future holds for the stadium and continuing our friendship with the Friends of the Miami Marine Stadium who obviously LOVE Parkour!!! We also hope that the video that we shot which showed the stadium in such a unique and beautiful way through the movement of Parkour, and which was seen by so many influential people, may have helped (even just a little bit) in saving the stadium. Below is a present day photo of the Marine Stadium, and if you haven’t seen it before, a replay of the WFPF video, “Parkour Playhouse, Abandoned Stadium” shot by WFPF’s Daniel Arroyo and crew and featuring athletes Ben Jenkin, Robbie Corbett, Phil Doyle, Marvin Ross, Justin Sheaffer, Jonathan Salcedo, and Daniel Arroyo.